I think I am pretty savvy when it comes to on-line purchasing. The last thing I thought is thatI would ever fall prey to is a Phishing scam, but Phishers are crafty. As a business we are regular Adwords users on Google. I had not used them in a while, so I reactivated a somewhat dormant account the other day.. A day later I ger an email telling me that my account information is not up-to-date, and that I need to correct it. Diligently I clicked in the message and went to the site that the email pointed me to adWRods.com . When I spell it out, it is obvious, but without the emphasis, it is easy to go to a bogus site. When I arrived at the site, it looked just like the Google site, and I readily provided the requested information. The last thing I would want is our Google campaign shut down because my credit card information was obsolete. Fortunately, the latest versions of the major browser try to give you a heads-up. In my case, I received a message that made me look closely at the URL. I was like they fly in the spider web. Once I was caught, I was doomed. Phishers are creative and ingenious. You have to be diligent every time you provide credit card information. The identity you save may be your own. I received an email from United Airlines today asking me to participate in a study on the "Elite Membership" kit they sent to me. I looked at the survey and thought - who put this together, their marketing intern. Actually, I think a marketing intern would have done a better job. So here is the question - can I read it if I don't receive it? It would not taken much brainstorming to figure out that this did not make any sense. 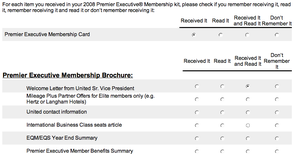 Then it asked me about my membership card, and had the same four options. I don't know about you, but I don't usually do much reading of my membership cards when I get them. The second page of the survey asked how useful this information was to me. I can't believe that they really think much of the advertising they throw into their envelopes these days is very useful to anyone. It brings me to my point. We assembled and sent out SubscriberMail's annual email survey in conjunction with the EEC this week. 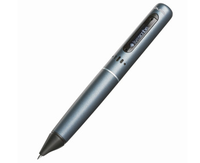 We initially sent a small sample to test questions and reports. When we got the sample back, there was a major back end issue with reports. We were able to reconfigure the survey and send it out correctly. If you are doing a survey, testing a small sample can give you great feedback on how to improve questions and what the reporting will look like. Don't trigger a survey without testing. Perhaps I was in the United test group - for their results sake, let's hope so. I found a great new little service that will help any marketer working on Search Engine Optimization. Yoocrawl crawls any web site and provides you with all of the related data to a site. Check out the IP addresses, outbound links, list of keywords, titles,etc. This is all data you can search for by reading the code and checking for the ip address, however, this little tool does it all in one place...for free. I love the power of the web for feedback. I had a community project I was involved in, and as part of that project I needed to conduct a simple survey. Before the web, undertaking this task would have been daunting. I would have had to print up surveys send them out (if I could afford the postage). Then wait until the surveys were returned and then tabulate them. If I wanted to get more details, I could get really fancy and run cross tabs. The cost of doing this kind of research was out of the scope of most community organizations (and many marketers). Tonight, I sat down at my computer, used Zoomerang to put together a very simple survey. I used our SubscriberMail system to send a message to the community (who had opted in to hear from us). Literally five minutes after I launched the survey, the data started to pour in. I can easily run cross tabs, and I can automatically send a follow-up email to anyone who has not clicked through to the survey. As a marketer...what is not to love.